What an honor to be a Chef Presenter for Goya Foods at the Hispanic Lifestyle Latina Conference. I wanted to make a dish that we serve at my restaurant and stay true to my cooking, but still using a product that I truly believe in. I love Goya and I won’t lie when I tell you that I was tickled to do a cooking demo for them. As a Latina Chef, Goya is a product that we take pride in. They have a wholesome, quality product. I was thrilled to find out the number of products that supported this dish. It was a great collaboration and I’m proud to share this recipe with you. Season your chicken with the Goya Perfect Seasoning, Black Pepper, Garlic Salt. 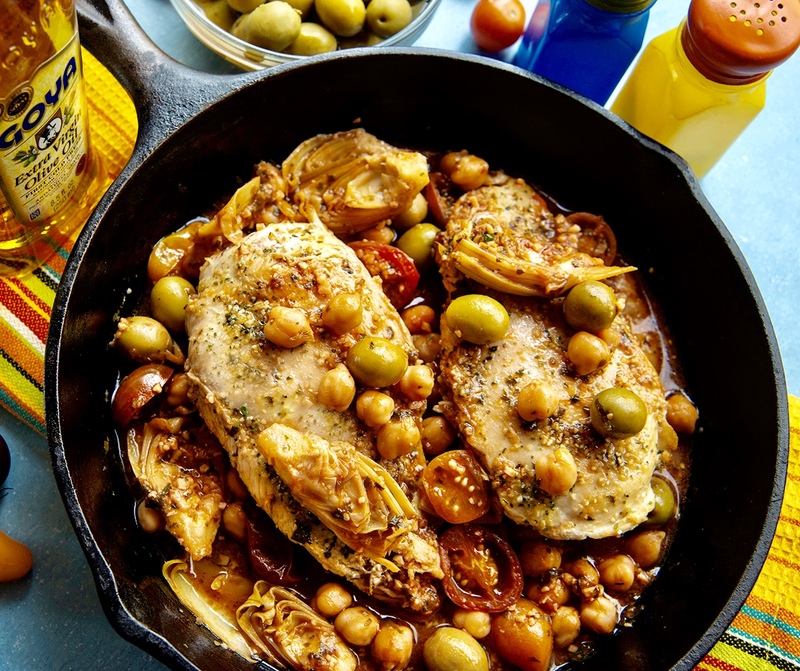 Heat and coat the the sauté pan with two tablespoons of the Award Winning Goya Olive Oil. Use more if necessary. Place the chicken breast on the sauté pan and cook it on one side for 2 minutes or until golden brown. Turn it on to it’s other side and cook it for a minute. Set the chicken aside on a plate when it is done. Using the same pan, add the onion, tomatoes, artichokes, chickpeas, capers and garlic. Stir until your onions are translucent. Make sure to stir well in to the bottom of your pan for the chicken drippings. Stir in two tablespoons of tomato sauce. Let it cook in for about 30 seconds. Add the wine slowly and stir it in for 30 seconds. Add 1 teaspoon of the Goya Seasoning with a ¼ of water. Stir your ingredients well. Add your chicken back to the pan. Add the fresh cilantro. Cook for another two minutes, letting that reduce to half. I recommend that you serve this dish with rice. Chef Rosie is the Chef Owner of Provecho Grill in Menifee, California and Xicana (coming soon). She is a two-time winner of the SoCal Chef Open and Farmer’s Market Flip, Season One, Episode One. She can also be found writing about food for Menifee Buzz and Valley News. Learn more about culinary events and food tours with Chef Rosie. Subscribe to her newsletter to get alerts about upcoming events. Patsy Cline, Rocio Durcal, Morning Dew and Me.